Call us today, start working tomorrow! If you are an established beauty industry professional, you owe it to yourself to check out Allure Salon Studios. We have excellent lease incentives for our new studio owners. Call us for a tour and we'll show you what we mean! Your clients will love it and so will you! 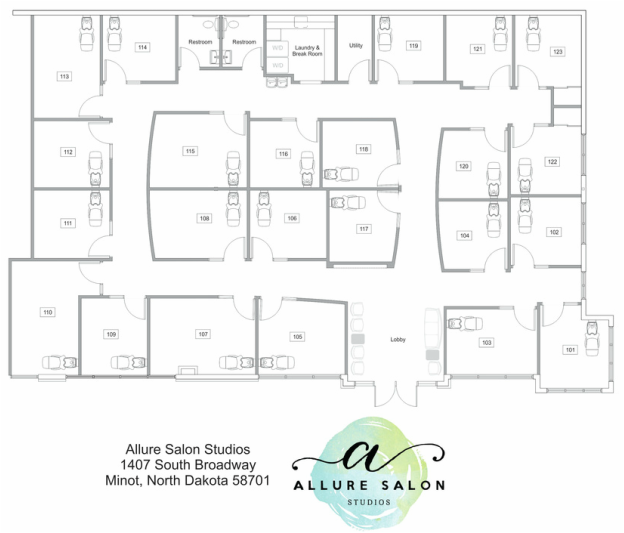 Over-sized studios (the largest average studio size in Minot, maybe even the whole state!) that YOU decorate to fit your own unique style (all of our studios are as unique as you!). At Allure, we don't try to cram you into the tightest place we can. We designed the largest facility with the fewest studios in the area. Do the math, you'll see! 24/7 access for you and your clients. Work the hours YOU want, not when some salon owner tells you to work! Security cameras cover the entire facility. WINDOWS...NATURAL LIGHT!! Many of our studios have windows and almost all have natural light access. Keeps you happy! Studios come set up with everything you need for your success: upgraded custom cabinetry (lots of it! ), granite counter tops, glass-front beverage cooler, styling chair, in-studio integrated shampoo bowl & reclining seat, towel cabinet, dryer & chair, etc. Move in today and work today! Location, location, location! In Liberty Square on South Broadway with FANTASTIC walk-in potential from one of the busiest streets in the entire area! Don't forget the nearby restaurants and other convenient amenities to make this a one-stop location for all your clients' needs. All this at the best price in the area! As you can see, there is a lot to like, and more that we haven't even listed (because the list would just go on and on and on...). Come see for yourself to get a complete feel for our facility. Great lease incentives available right now. Check us out, we can probably save you money and provide an upgrade to your current situation! Call Willy today at 701-720-9199 for more information, or email us through the contact form below.